For other uses, see Tobruk (disambiguation). Tobruk or Tobruck (Ancient Greek: Αντίπυργος) (/təˈbrʊk, toʊ-/; Arabic: طبرق‎, translit. Tubruq Ṭubruq; also transliterated as Tobruch and Tubruk, Italian: Tóbruch) is a port city on Libya's eastern Mediterranean coast, near the border of Egypt. 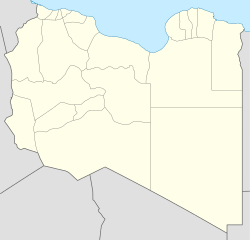 It is the capital of the Butnan District (formerly Tobruk District) and has a population of 120,000 (2011 est.). Although the siege was lifted by Operation Crusader in November 1941, a renewed offensive by Axis forces under Erwin Rommel the following year resulted in Tobruk being captured in June 1942 and held by the Axis forces until November 1942, when it was recaptured by the Allies. Rebuilt after World War II, Tobruk was later expanded during the 1960s to include a port terminal linked by an oil pipeline to the Sarir oil field. An aerial image of Tobruk's harbour. Previously, Tobruk was some 470 km (290 mi) from Benghazi through the Libyan Coastal Highway, but this distance was shortened to 450 km (280 mi) after the construction of the Charruba–Timimi Road between the years 1975 and 1985. Construction of the Tobruk–Ajdabiya Road reduced the distance between those two cities from 620 km (390 mi) to about 410 km (250 mi). An Ancient Greek agricultural colony, Antipyrgus (Ancient Greek: Αντίπυργος) was once on the site of modern Tobruk, and the ancient name is still occasionally in use. The name roughly meant "across from Pyrgos", referring to a location in Crete across the Mediterranean Sea from Antipyrgos. In the Roman era, the town became a Roman fortress guarding the Cyrenaican frontier. Italian forces (and their native Libyan allies—about two divisions of the latter) invaded Egypt in early September 1940 but halted their advance after a week and dug in at Sidi Barrani. In early December, British Empire forces—an armoured division and two infantry divisions—launched a counterstrike codenamed Operation Compass. The Italians had previously invaded Albania and occupied part of the south of France, and had now made a military incursion into a British protectorate. Omar Mukhtar was born in Zanjhur a Place near Tobruk. ^ "Tubruq - Wolfram-Alpha". wolframalpha.com. Retrieved 26 December 2015. ^ a b c d e "Tobruk" (history), Encyclopædia Britannica, 2006, Britannica Concise Encyclopedia, Concise.Britannica.com BC-Tobruk Archived 2008-01-02 at the Wayback Machine. ^ "Klimatafel von Tobruk / Libyen" (PDF). Baseline climate means (1961-1990) from stations all over the world (in German). Deutscher Wetterdienst. Retrieved 28 March 2016. ^ weatheronline.co.uk. "Daily Hours of Sunshine - Tobruk - Climate Robot Libya". www.weatheronline.co.uk. Retrieved 19 April 2018. ^ "Greek oil tanker bombed in Libyan port of Derna". BBC News. Retrieved 26 December 2015. ^ Chris Stephen. "Libyan parliament takes refuge in Greek car ferry". The Guardian. Retrieved 26 December 2015. ^ "Libya's Islamist militias claim control of capital". Associated Press. The Washington Post. 24 August 2014. Archived from the original on August 25, 2014. Retrieved 26 August 2014. ^ Ulf Laessing (2 October 2014). "Insight - Libya's runaway parliament seeks refuge in Tobruk bubble". Reuters UK. Retrieved 26 December 2015. ^ "Al Masira Hotel". tripadvisor.co.uk. Retrieved 26 December 2015. ^ "Libyan court rules elected parliament illegal". aljazeera.com. Retrieved 26 December 2015. ^ "Libyan Transitional Government-Bureau Of Prime minister (defunct)". pm.gov.ly. Archived from the original on 17 January 2012. Retrieved 19 April 2018. Wikimedia Commons has media related to Tobruk. This page was last edited on 3 March 2019, at 21:24 (UTC).